My name is Christa Thieme, and I’ve been asked to be a guest writer, and share my story because this month is National Childhood Cancer Awareness month. Spoiler alert: my child has cancer (still strange to write). So, here is our story. It seems to me in my short experience with motherhood that there is a strange paradox that at least goes on in my head, and somehow I think I’m not alone. As a mom, I worry about EVERYTHING! Since my son, Charlie, was born in May, everyday when my husband came home from work, I had a new “fear of the day”. Whether it was tummy times, feedings, diapers, SIDS, the fears never ended. Most of my fears were incredibly irrational, but what happens when a seemingly irrational fear is right? So, here is where the paradox occurs…you have all these fears about what could happen to your child, but when the fear actually does comes true, you think, “This only happens to other people’s children” “My child can’t possibly have a rare cancer”. When Charlie was 6 weeks old, I started noticing a strange yellowish glow in his right eye under certain lighting and in certain angles. After I saw the “glow” the third time, I realized this probably wasn’t normal. Something (I believe God) prompted me to look at pictures I had previously taken of Charlie. Every picture taken of him with the flash on, his right eye glowed white, while his left eye glowed the typical red. Being a concerned mom, I started googling what it could be, and all signs pointed to retinoblastoma. We took Charlie to his Dr. the very next day. The Dr. said his eyes looked perfect, and he would see Charlie again when he was 6 months old. The Dr. also said he saw the “red eye reflex” in both eyes, so, there was no need to worry. Scott and I left the appointment feeling somewhat reassured, but still wanted and explanation for what we were seeing. We decided to get a second opinion. My sister in law gave us the great advice, “if you are going to get a second opinion, make it count.” Over the weekend, I researched Dr.’s at Riley Children’s Hospital in Indianapolis, and found Dr. Plager – the Medical Director of Pediatric Ophthalmology, and a specialist in retinoblastoma. I called the following Monday, and amazingly we were able to get into their office on July 19th, just a 3 week wait time. At that appointment is when our worst fears were realized. 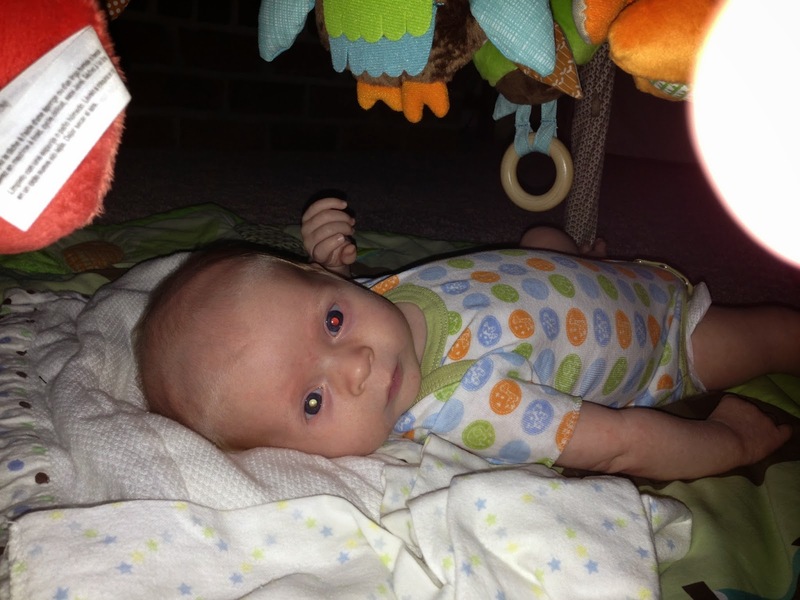 Charlie had a fairly large mass in his right eye called retinoblastoma. Retinoblastoma is a cancerous tumor in the eye that is caused by a cell that is responsible for developing the eye that goes haywire, and never “turns off”. While retinoblastoma only effects 300 children under 5 years of age every year in the U.S. and Canada, since Charlie has been diagnosed, there have been several people that our friends or family have known that have had children with the disease. The best news we received is that Charlie will survive this cancer. It is the most curable of all of the pediatric cancers, and the earlier it is caught the better the chance of saving the eye and vision. Despite the positive news of his survival, it was still a hard pill to swallow. I just remember crying while holding my 11 week old baby, and just feeling outside of my body, like this was just a really, really bad dream nightmare. This could not possibly be happening to my precious Charlie. Every time I heard my husband deliver the news to a family member on our two hour drive home, it was like another punch to the gut. We got the news on a Friday, and following week was filled with an MRI, exam under anesthesia, surgery for his central line, and round 1 of chemo. 1. Trust your gut and God’s leading. If you sense something not right with your child, act on it. I would rather look foolish to my Dr. and be wrong, then not act on something, and be right. 2. Don’t be afraid to get a second opinion, and make it count! 3. During well baby check-ups, when your child’s Dr. is looking in their eyes with that light, they are looking for the red eye reflex. In order to truly identify the red eye reflex, the room needs to be dark, and your child’s pupil large. Insist that the lights are off and blinds are drawn. When our Dr. was looking at Charlie’s eyes, the room was bright, and that is probably how he missed the tumor. 4. True joy can be found in the midst of heartache. It’s possible to grieve and rejoice all at the same time. I never imagined this road of suffering could offer joy, but it does. Unexplainable joy only given as a gift from God, at a time when it’s need most. Here is the latest update on our precious Charlie. Last Tuesday the 17th, we had a eye exam under anesthesia. This was the first one since he’s been diagnosed, and started chemo. After our ophthalmologist examined Charlie’s eyes, he came back to report his progress to us. He was stunned, and said that Charlie’s tumor has shrunk significantly, and his retina has reattached. We were previously given a 0% of Charlie ever having vision in that eye or even saving the eye, and his retina was almost completely detached. We were just buying time by doing chemotherapy treatments until he was old enough to have his eye removed. Since Charlie now has a promise of saving that eye, and even vision, there is another treatment that is more of a localized chemotherapy that we will be exploring in Philadelphia in the next few weeks. We are just so thankful for all the prayers, and for God’s healing hand on our Charlie. Retinas do not just “reattach” on their own, and we know it is Our Great Physician who has worked a miracle in our boy. I pray that this would never happen to any young children that you all may know, but if it does I hope this helps to bring awareness to the disease. This is the “glow” of the tumor that we could see in certain lighting/angles.